Help us uncover the Boxford Mosaic! Cotswold Archaeology is proud to have been involved with the exciting Boxford History Project investigation between 2012 and 2017. 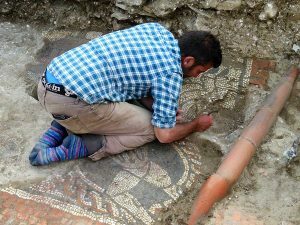 That project culminated with the fantastic discovery of a major Roman mosaic, described by experts as the most important new mosaic find from Britain in the last 50 years. Careful excavation, with our staff supporting a great band of volunteers, revealed about half of the mosaic, which is covered in Greek mythological characters, but time did not allow us to investigate its full extent. The Boxford History Project has been focusing subsequent efforts on fundraising so as to realise it’s ambition to return to the site and fully excavate the mosaic, and so discover more about its date, construction and what the images tell us about the people responsible for its creation. Great strides have been made and some very generous donations have already been confirmed, but to enable the project to meet its objectives further donations are being invited through The Good Exchange website.